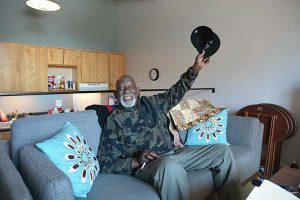 On a sunny March afternoon, Melvin, 76, sat on a sofa in his downtown Saint Paul apartment with a smile as bright as the sunbeams streaming in his windows. After experiencing health problems and homelessness, Melvin now has a home of his own, his health conditions are being managed and he is equipped to not only deal with life, but enjoy his days. Melvin, who used to work on Alaska’s fishing ships in the Bering Sea—the kind many see on the Discovery channel—has grown past his working days. He suffers from COPD and congestive heart failure, among other challenges. He gets around with the help of a cane. He needed—and received—holistic care not only from Catholic Charities but also wonderful community partners including Bridging, MN and Aeon. When Melvin was released from the hospital three months ago, he was admitted to the Medical Respite program at Catholic Charities’ Higher Ground Saint Paul. There, he had a private room to sleep and heal, nutritious meals to eat and supportive staff to manage healthcare and offer support. Denise Williams is a Behavior Health Professional at Catholic Charities’ Medical Respite, providing assessment, counseling services, and client specific mental health referrals. “Melvin communicates his needs and expects us to do our part. I enjoyed advocating on his behalf and making sure all of the steps were followed in order to get him safe, stable and comfortable. He can now relax and enjoy life again,” Williams said. Melvin, who jokes he’s an old man with no time for computers, was worried he would no longer receive his Social Security checks, but Denise helped him change his address in the system. Little moments of assistance have big impact for those in need, in so many ways. After Melvin healed, he had a place to lay his head at Higher Ground Saint Paul Shelter. Then, our Catholic Charities’ Aging and Disabilities Services team helped Melvin find a new home at an Aeon property in downtown Saint Paul, but it was unfurnished. Melea Blanchard, a program supervisor with Catholic Charities’ Aging and Disability Services program, drove Melvin to Roseville one morning for his shopping appointment at a Bridging warehouse. With the help of volunteer shoppers Sheila and Marilyn, Melvin was able to select items he needed for his apartment. Before his appointment, Melvin was living out of his suitcase, sleeping on a flat air mattress and cooking in aluminum pans from the dollar store. He didn’t know what to expect, but he was hoping for a bed and a TV or radio so he’d have something to listen to besides his own mumbles. “I thought it would be nice and I thought, maybe Melea exaggerated it a little bit, but this is beautiful. This is starting me out on a new life. I didn’t have anything when I walked through these doors but a half blown up air mattress,” he said as leaving Bridging. Melvin received all of the necessary items to outfit his home—everything from cookware to art for the walls, places to sit and even an ironing board. A day later, Bridging delivered his furnishings and Laurel and Ka, social work students interning with Catholic Charities’ Aging and Disabilities program, came by to rearrange furniture and help turn his apartment into a home. Sitting on his new bed in his own bedroom, he was overcome with emotion on how many people had helped him come so far. Now that he has a home, Melvin has his sights set on his next goal. One day, Melvin hopes he will be able to have a puppy. “I love dogs. I just want to first get a handle on my medical issues. Before I can take care of a dog I’ve got to be able to take care of myself,” he said.